In the fourth month of the one thousand and twentieth year of the reign of the Diamond Empress of Lucien, a son was born. He was the seventh living son of the Empress – and there was much hope that he would remain so. On the day of his birth, as was customary for children born of the Empress and the Most High, he was examined by a council of twelve clockwork men known as the Visigony. Their purpose was to ascertain the child’s future: theirs was the choice whether he would live or die. Almost seven hundred children of the Empress had passed through their hands, as well as several thousand of those born to the women of the Most High. Defects were not tolerated – if the child had been disproportionate, if he had been sick or weak, if his skin had exhibited the smallest blot or sign of mortality, they would have cast him off the edge of the highest tower, there to meet his death as a disgrace to the Empress and an unfit heir. But he passed their scrutiny, and it was whispered that this child, born as the seven hundredth, was the true seventh child, the one to inherit the Seventh Principality. The boy was sent to live with the Visigony for seven days, as was customary. He was fed nothing, given nothing to drink, and left to die. On the first day, he cried – but this was not uncommon. The Visigony reserved judgment. On the second day, he cried still more, but from time to time was silent. The hunger was beginning to affect him, to sap his strength at the moment of life when he needed it most. On the third day, he whimpered through the morning hours, begging wordlessly for help and strength from his absent Mother. But he would not find help from Her, the Visigony thought with ruthless, mechanical smiles; that Woman would never help him. On the fourth day, there was no noise – and the Visigony began to move about the Fortress anxiously as they always did when sensing the nearness of a Death. Those servants who worked in the Fortress spread the word, and soon most of the inhabitants of the capital city of Lucien knew that the child was soon to die – that the seventh heir was yet to appear, that the child was Baseborn after all. On the fifth day, the child began to whimper once more – and word blazed through the Fortress, this time reaching the Ear of the Empress Herself. But the Visigony were cautious. Some of the Most High had strains of power from early bloodlines that allowed them to last the first five days; indeed, that was the foundation of the Bloodmages. No, the child must survive the full seven days. They waited. Terrible things began to happen in the capital city. Sandral Putnam woke to find her cat Solem dead as if she’d been gone a week, skin sloughed off her body and maggots bursting from her stomach. Across town Bellamy Jones walked out of his house the morning of the sixth day and felt something crunch under his foot. He looked down to see twelve vultures lying in a perfect circle in the middle of the street, having dropped from the sky in mid-flight, dead. Tim Hightower, a man in perfect health, was found in his bed, eyes wide and staring at nothing, all meaningful signs of life gone from him, left as nothing more than an empty shell. The Visigony saw and recorded these signs, and waited for the next dawn with whatever sense of anticipation their dusty, dry veins were capable of containing. On the seventh day, the child still lived – and not only did he live, but he had grown, as if he were seventh months old not just seven days. He moved more easily than any child the Visigony had ever examined: his arms and legs were strong, his eyes bright and intelligent. His reactions were perfectly preserved, showing no sign of nerve or brain damage. He made no sound now – but his eyes recognized them, and they, who were once men in an age long gone, felt a supernatural chill run through their dried up hearts as they contemplated this child with their clockwork eyes and were inexplicably reminded of their own mortality despite the steps they’d taken; the boy was filled with such an abundance of life that they were almost blinded. The Visigony reported their findings to the Empress as she sat on the Diamond Throne. The boy had passed their test: he had survived the seven days and was therefore a true son if the Empress would have him. So the Empress gathered together her Children, the six sons and daughters among the seven hundred she had born that had proved to be of the Imperial Blood, and so had been allowed to live. The Children were a spiteful lot, full of all the vices of humanity: they were proud, greedy, lustful, and full of rage, as was their Great Mother the Immortal Empress. Like their Mother, they too were unaffected by the passage of time, and over the years they fought each other for their Mother’s approval and love, winning and losing petty battles that destroyed the lives of thousands of citizens of the Empire. Their Mother pitted them one against the other, and they lived like hunted and wounded animals, all the while loving her and hoping for nothing more than the chance to do Her Will. It was to these creatures that the baby was brought. Rikard, the Prince of Lions and eldest son, tested the boy’s courage and with great reluctance found him satisfactory. Geofred, the Prince of Eagles, tested his intuitive sight and mental alacrity, which he found adequate. Symanta, the Prince of Snakes, tested his cunning and perception, which she grudgingly agreed were acceptable. Ramael, the Prince of Oxen, tested his strength and determination and angrily growled his approval. Dysuna, the Prince of Wolves, tested his endurance and loyalty, which she confirmed as meeting their Mother’s standard. And finally Tiffenal, the Prince of Foxes, tested his luck and ties to the strings of fate, and sardonically pronounced him fit. When the boy had passed each of their tests, the Empress herself took him into Her arms. It was Her place to judge the boy’s ambition. She laid a single finger, long and cruel, on the boy’s forehead, and reached into his soul for the final test. With a hissing cry, she flung the child from her; the boy began to cry in pain and fear, and the Empress, a hateful expression of disgust and contempt marring the perfect features of her ancient beauty, motioned sharply to the waiting Guardians. The hulking men drew their swords and approached the child, ready to rend him limb from limb and display his body on the palace walls. But Geofred, the Prince of Eagles, stepped in front of them. The Empress spit out a single word, her crown burst into dazzling light, and the Prince of Eagles flew across the throne room, straight for one of the Blackstone walls. With a muffled thump, he crashed into the hard stone and fell to the floor. But despite this blow, he came immediately back to his feet, and without hesitation dashed forward, placing himself on his knees in front of his Mother. The light from Her crown grew even brighter, a light that made the world seem harsh and terrible, but before she could speak another word of power, he began to talk in a voice pitched so only she could hear, gesturing toward his newborn brother, his eyes on his Mother’s feet. Slowly her anger subsided as the Child spoke. A smile crept across her face. For all who might oppose you shall be gone. The Empress once more took the child in Her arms, watching him carefully. It was not uncommon for prophecies to require sacrifice to be made true. In fact, for such a thing as the Return, a great sacrifice was only to be expected. Was this boy the answer? She tested him again, delving his mind for ambition, testing his fitness for the office of the Seventh Principality. Again, She found him lacking. A smile curved across Her face, etching itself like acid upon a stone sculpture of beauty. None other knew the prophecy, nor the one that followed, but for the Prince of Eagles, who was entrusted with the keeping of all the prophecies that the Chamber of Seers had read. He was bound to silence with ancient vows of power; he would not reveal Her plans. She raised the child above Her head, and held him as he squirmed pathetically in Her firm grip. Her brood watched from under darkened brows – would She cast him down? Or would She raise him up? That day the word went out across the Empire that in the Fortress of Lucien a son had been born and claimed. 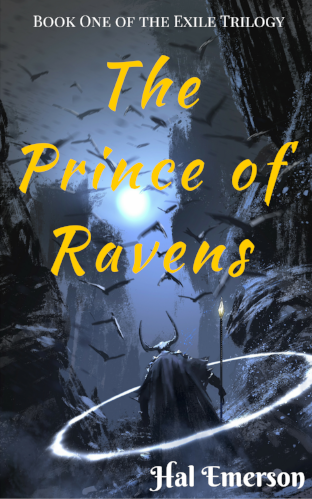 The Prince of Ravens, the herald of the end times and keeper of Death, lived and breathed in the dark city of Lucien. The Prince of Ravens stood gazing out of his room’s large arched window at the distant horizon when the clock struck the hour and the celebratory bells of his name day rang out once more across the city. It was late morning, only an hour short of midday, and yet the entire city spread out before him was cloaked in shadow. Then again, the city was always cloaked in shadow, for in the sky hung the dark, ever-present, billowing clouds that bore witness to the Empress’ power. Today they were shot through with still darker threads that showed they were heavy with rain. Most of the city’s people were indoors keeping dry, but the Prince of Ravens had always liked the rain. A wind sprang up and rushed in through the open doors of the balcony to ruffle the Prince’s black hair, blowing it off his forehead, and then decided to play fitfully with a few of the longer strands that fell halfway to his shoulders. His eyes, darker and blacker even than the clouds, stood out in sharp contrast to his pale white skin that had never known anything but the cloaking shadows of the city and the closed interior of the Fortress. His clothing completed the somber appearance: robes dyed midnight black after the color of his office. The clouds stretched across almost the entire sky – but stopped just short of the horizon, giving a slim, bright, tantalizing view of a world outside Lucien. There, barely visible, was the touch of green that he imagined to be trees, and the bright gleam of sunlight reflected off a blue splash of lake. They were no more than fleeting impressions, flashes of light and swirls color, which somehow made it through the murky darkness of Lucien to the Prince’s window. As he’d done countless times before, he tried to estimate the distance: twenty leagues? Thirty? The Prince knew how far a mile was, but had little practical application of judging distances. The Fortress was high enough that the view was largely unimpaired, but still this vision hovered on the very edge of sight, the very edge of the Empress’ immediate influence. It was far, however many miles away it was. Someday I’ll go, the Prince said silently, trying to will the words to be true the way his brother Rikard had instructed him. Someday I will stand in the light. The clouds were constant here – the will of the Empress made it so, and as such there was no circumventing the fact. There had not been a patch of sunlight over the sprawling capital city of Lucien and the surrounding countryside in the Prince’s lifetime, nor for many years before that. But he had read of the sun, in books he wasn’t supposed to know existed, in the deep bowels of the Fortress. Part of him, the part that needed to see things for himself in order to believe them, felt there couldn’t truly be such a thing. A giant ball of fire hanging in the sky? Ridiculous. There might not even be grass or trees or streams, or anything of the sort, no matter what anyone said. All that there was, all that there must be the whole world over, was the bright metal of clockwork inventions, and the dull gray-black of stone towers covered with the murky soup of industrial soot. That was all there was of his world, and all that would ever be. Once he proved himself to Mother, she would let him leave the city. She had promised she would … and then he would go to see for himself, one way or the other. The skin on his back and shoulders grew warm and he tensed. An instant later the outer door to his chambers opened and sent a soft breeze through the room, light enough that it did not stir his heavy black robes and should have gone unnoticed. Indeed, it would have if anyone but the Prince of Ravens had been listening. Quiet, stealthy movement, and then the door was shut once more. A sense of something dry and stale that reminded him of rustling scales and cold reptilian eyes bloomed in his mind, born of the new presence permeating the room. Beneath that sense was a boiling, sickly corruption, like the white fluid secreted from a dying plant. The Prince felt his stomach churn and he fought back the urge to be sick. The feeling passed as it always did, and the Prince took a shallow breath in through his mouth. The interloper moved a step closer, stopped, and stood watching the Prince’s back, unmoving. The Prince knew who it was – he always knew when one of the Children was near. They left a much more profound imprint on the world than the Commons and Baseborn, and with the powers of the Raven Talisman he could sense them immediately when they were near. He decided to let her speak first and so remained stationary, staring out his balcony doors, feigning ignorance of her presence. “Hello, brother,” said a soft and silky voice behind him. “Hello, sister,” the Prince said immediately, with a touch of boredom. He heard a rustling as she shifted in surprise, again sending images of dark scales and a sinuous form though his mind. All of his siblings were uneasy about how attuned he was to life – it was the only thing in which they could not best him. Not that it matters, the Prince thought. As of yesterday he was the lowest of the Children. Still, his siblings hated anything that made him seem somehow better than them in the eyes of their Mother, even if the difference was ultimately unimportant. “What is it you need?” the Prince asked in a civil monotone. “Always staring out the window,” Symanta said, ignoring his question. She was sending a message: she would get to the purpose of her visit when it pleased her. The Prince didn’t respond immediately. She wouldn’t have understood him if he had tried to explain – none of his siblings wished for anything but more power, for a way to control the area covered in darkness. None of them thought of the area outside of Lucien, even though they lived there for the majority of the year in their respective Principalities. Perhaps they had once – the Prince liked to think that they had, particularly his brother Geofred. He wondered vaguely if someday he too would forget his dreams of the sun. “Nothing of importance,” the Prince sighed. “Liessss,” Symanta responded immediately. Without turning, the Prince knew her Talisman markings were glowing a sickly green, standing out along the sides of her long, graceful neck and over the backs of her hands as she sensed the half-truth that the Prince had spoken. His heart beat faster for a handful of seconds before he could calm it and relax his suddenly tense shoulders. He turned to face her. She breathed in sharply through her wide, flat nose and her eyes narrowed dangerously. It was a crime for any to speak the names of the Children, and though such laws did not apply to the Children themselves, such a thing was still discourteous. However, his answer was ambiguous enough to pass the Snake’s test, and though she pierced him with her pale green eyes, studying his face for even the smallest trace of untruth, she found nothing. The Prince’s heart fluttered nervously again, even though he knew his sister’s powers did not extend to mind reading. The mind was impenetrable – not even the Empress could break into a person’s mind unless they allowed it. She could command them, force them to do Her will, but she could never know the inner workings of their thoughts. Many feared she could, even the Most High, but the Children knew otherwise. Not even Rikard, who had been alive for nearly five centuries and possessed the Lion Talisman, had that kind of power. “Mother hasn’t made a judgment yet,” the Prince said. “Truly? I hadn’t noticed,” he responded dryly. “You think in all that time you’d have learned to control your temper,” he responded, taking out his anxiety by goading her. Her cheeks bloomed with pink spots and she seemed ready to spit at him. But instead of lashing out, she smiled, and the Prince felt chills go down his back. Lesser men were known to cry and beg in gibbering madness when something caused Symanta to smile, but he was a Prince, and he would not cringe when his sister threw a tantrum. The Prince’s skin began to prickle. What was this? “Do you have a message from Mother?” the Prince asked quickly, his mouth dry. “No,” she said, and paused. The Prince’s heart stopped dead for a beat, and when it started again his chest felt as though it were being squeezed by a vice. His palms became slick with sweat and a roaring sounded in his ears. It took all of his will power to give no visible sign of his distress as Symanta crossed the room with her sinuous, hypnotizing walk, and sat down at the large oak writing desk. A Summons. The Empress did not Summon Her Children. “What have you done, little brother?” hissed the Snake. She leered at him, and the Prince’s mind was taken back to the days when he was growing up, before he had received the Talisman, when she had taken out her anger on him. But he shook that off; she could not hurt him anymore, at least not like that. The irony of the situation was that he truly couldn’t answer her, even if he had wanted to: he had no knowledge of what he’d done. Exactly a week previous, the word had been sent out by Imperial Decree that he had been Unnamed, a disgrace saved only for the lowest of the low. When he had arrived at the Imperial Chambers, overcome with guilt and shame, to ask what he had done to deserve this punishment, he had been turned away. He, one of the Children of the Empress. And now a Summons … shadows and light, what had he done to deserve this? What had he done? Through his haze of shock, the Prince noticed that Symanta was sitting in the carved wooden chair behind his desk. His room was sparsely furnished, something that set him apart from his siblings, but what he did have was meaningful to him, and something inside his chest grew hot and angry at the thought of Symanta touching any of it. The Prince moved over to the writing desk, all the while managing to keep his face neutral and expressionless. He could feel his lips trying to twitch in disgust as he looked at her sprawled in his chair, but he wouldn’t let them do so. If he showed her what he was thinking, she would have an edge on him. The Snake Talisman she possessed was based on other’s reactions, and if he gave her nothing more than one twitch of an eyebrow she would be able to read him like a book. It was no mystery why she was the head of the Seekers. “For you, dear brother,” she said, holding out a parchment scroll. Her hand was covered in green veins, and it looked almost as if it were molting. The Prince reached out, keeping his face emotionless, and took the scroll. In a flash of movement, the Prince of Snakes lunged toward him. He knew it was coming, but the action still almost made his stomach empty its contents. The sense of corruption and bile was amplified tenfold as Symanta grabbed his wrist and the green lines on her hand pulsed with a sickly light. But the Prince’s only outward response was to look calmly into his sister’s face. For a moment, the beautiful, seductive mask she often wore had been replaced by a look of gleeful triumph, but just as quickly the look disappeared and was replaced with confusion, and her eyes jerked down to the Prince’s hand. The Talisman of Snakes required one of two things: signs of emotion, or physical contact. A person could stifle their emotions to the point where they wouldn’t show, but they could never get rid of them entirely, and so through touch Symanta could sense anything a person might try to hide about their emotional state. The Prince of Ravens didn’t know how it worked, and he doubted he ever would, but he knew that if Symanta touched his skin she would know exactly how he was feeling, and he would be in her power. However, the Prince’s wrists and hands were covered in thick riding gloves against the cold of the open balcony doors. For a moment, Symanta stared dumbly at the Prince’s hands, and then she let out a snarl and ripped her hand back, leaving the piece of parchment clutched in his fist. Symanta stood stock still, completely at a loss for words, though quite clearly full of an inexpressible wrath at being outwitted. And then, quite abruptly, she spun on her heel and stalked out of the room, all the time seeming to slither, her body undulating with each step. You are Summoned into the presence of the Empress of the Diamond throne, ruler of Lucia, Mother of the Children of the Seven Principalities, Possessor of the Light, the Fearful Shadow, the Grace of Gods and Men, to discuss your Inheritance. The message was signed by the Hand of the Empress, a short, small, ferrety man who carried out the Empress’ commands. He turned to look out the balcony doors so quickly he cricked his neck. He stumbled forward, breath coming in short, surging pants. The balcony looked out toward the south … toward the Seventh Principality. Each of the Children ruled a separate part of the Empire, which as a whole consisted of seven provinces that had once been nothing but uncharted territory inhabited by savages. When the Empress had arrived from across the ocean, she had expanded her territory one province at a time, using fire and the sword. The original inhabitants were quickly dealt with, and those that foolishly chose to fight instead of accepting the Empress as their rightful ruler and the embodiment of the Gods, were killed. For nearly one thousand years the rule of the Empress had brought peace to the provinces, all but the Seventh, which was the final resistant stronghold of those who called themselves the Exiled Kindred. When the Empress had crossed the sea, she had brought with her seven talismans of power. She had kept them with her always, but the time came when she needed to expand her hold of the Empire. The rebels had infiltrated her government, causing unrest and dissension in the six provinces under her rule. The capital cities began to suffer riot, famine, and plague, spread by the Exiled Kindred, and she needed help in order to crush them completely. And so, five hundred years after her rule began, the Empress bore a son, the first Son of the Empress, Prince Rikard, who inherited the most powerful of the Empress’ Talismans, making him the Prince of Lions. Wherever he went, he turned people to the cause of the Empire, shining like a bright light in the eyes of the lost, a safe harbor for those who had been unsure which side to choose. He drove the rebels from the Empire, and then took up residence in Tyne, the most prosperous of the Provinces, and was named Lord Commander of the Armies of the Empire. Each of the Children born thereafter was given one of the Talismans. Many children were born, but only six more, the Prince of Ravens included, were selected as true Children of the Empress, embodying those virtues that she found most important. Each of the Children, at a certain point in their life, was given a task to complete to show their Mother they were ready to rule a part of her land. This task, and the rewards given to them after, was called their Inheritance. It was well and widely known through prophecy that the Prince of Ravens’ Inheritance was to wipe the remainder of the Exiled Kindred from the land of Lucia, and to reclaim the seventh Province, the Province farthest to the south, for the Glory of the Empire. Was this why Mother had been so harsh? To prepare him to receive his Inheritance? He looked out his window once more. Perhaps I will see sunlight sooner than I’d hoped.